Next available “Have-a-Go” days, no booking needed. For the Have a Go days, you don’t need to book or bring equipment, just turn up and have fun. Available beginners’ courses; no previous experience of archery is needed. Booking and payment in advance required. Each course is made up of 4 sessions and a session is 2 hours long. So for the 4 sessions, each course gives you 8 hours of tuition. Saturday 9th February 2019 10:30 am – 12:30 pm, course, continues on 23rd Feb (note the gap for a club competition), 2nd March and 9th March. Our Beginner courses are on Saturday mornings at One Tree Hill, four times a year in conjunction with the school terms and cost $210 per person, including GST. All equipment and coaching is included and you need to be 10 years old or more to join these courses. If you do decide to join our club after successfully attending and passing one of our courses, we will offer you a further 4 one hour coaching sessions as part of your initial membership. It’s during these follow on sessions that we typically measure you, so you can go and buy your new bow. The best way to start archery is to do one of our beginner courses to learn the basics so you can join a club and start shooting. We also offer two “Have a Go” sessions each year for those who just want to try it before they commit to a course. One of the amazing things about archery is you can be any age when you want to start! It’s also a great family sport where the whole family can join in. Already done a beginner’s course somewhere? No problem! Come and see us on a Saturday morning so we can help you out with your membership. We recommend seeking some advice before spending a lot of money on equipment which may not be suitable for you – but don’t worry, we supply all the equipment for the Beginner course and the Have a Go days, so you don’t have to buy any equipment before you arrive. Please be aware that we can’t take children under the age of 10 because we are limited by equipment. 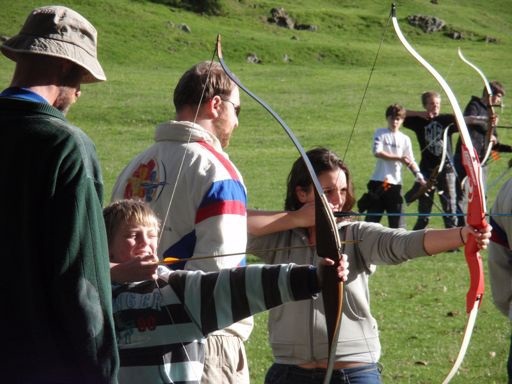 Try Mountain Green Archery Club as they do have the ability to take kids from the ages of 8. www.mgac.co.nz is their web site so do please contact them directly. If you would like to book on a course or have any questions about the course, please email coaching@aucklandarchery.org.nz. If you are interested in doing a beginner’s course earlier than this, please contact our coaching coordinator below to see if there are other times available, or you can contact Shore Archery Club, Massey Archery Club or Advanced Archery for private beginner’s courses. Some of the field archery clubs also do beginner’s sessions, but you may have to Google or contact them for more information. Check out this handy Auckland Map for who’s close in your area. The times and dates for our courses are shown at the top of this page. We accept payment by bank transfer so you can email for the bank account details. The application can be accessed from the link below. Please contact the coaching coordinator to register your interest before sending in your form. For any further information or any questions on the coaching or to reserve a place, please contact the Coaching coordinator: Tony coaching@aucklandarchery.org.nz.